A 10K with a stroller- it may just be a new Guinness World Record. 30-year-old Rachel Bowling ran the LowCountry Habitat for Humanity Resolution race in South Carolina to try to be the fastest woman for this race while pushing a double stroller. Check out the video and story below! ACCRA, Ghana (AP) — Melania Trump opened her first big solo international trip as U.S. first lady on Tuesday with a wave, a smile and a baby in her arms, aiming to promote child welfare during a five-day tour of Africa. She arrived in the West African nation of Ghana after an overnight flight from Washington and quickly made her way to the Greater Accra Regional Hospital. The first lady saw how babies are weighed — they’re placed in sacks that are then hung from a hook attached to a scale. She also watched a nurse demonstrate how vitamins are administered to babies by mouth and toured the neonatal intensive care unit. Mrs. Trump also cradled an infant and declared the baby a “beautiful boy” as she handed him back to his mother. Mothers at the hospital for her visit received gifts of teddy bears nestled in white baby blankets, personally handed out by the first lady, according to her spokeswoman, Stephanie Grisham. The items carried the logo of “Be Best,” the child well-being initiative Mrs. Trump launched last May. With the Africa visit, the first lady aims to take “Be Best” and its focus on opioid abuse and online behavior to an international audience. The first lady also had a private tea with her Ghanaian counterpart, Rebecca Akufo-Addo. They exchanged gifts: a Chippendale silver tray embossed with an image of the White House inside a leather case signed by “First Lady Melania Trump” for Akufo-Addo, and Kente cloth and artifacts for Mrs. Trump, according to Grisham. The first ladies met privately for about a half-hour at Jubilee House, Ghana’s presidential palace. The two first met last week in New York at a reception on the sidelines of the U.N. General Assembly, where Mrs. Trump spoke about her upcoming trip. Mrs. Trump’s visit opened in low-key fashion. Several Ghanaians interviewed said they knew little about it. Other locals said they knew about the visit but didn’t know what Mrs. Trump was doing. Mrs. Trump landed in the capital, Accra, on Tuesday morning after a more than 12-hour journey from Washington. She was welcomed at the airport with dancing and drumming, schoolchildren waving mini U.S. and Ghanaian flags and the gift of a flower bouquet. Akufo-Addo was at the airport to welcome her. Mrs. Trump also plans to visit Malawi, Kenya and Egypt. AP reporter Francis Kokutse in Accra contributed to this report. 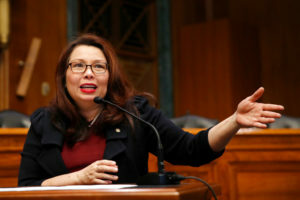 CHICAGO (AP) — Sen. Tammy Duckworth has given birth to a baby girl, making her the first U.S. senator to give birth while in office. The Illinois Democrat announced she delivered her second daughter, Maile (MY-lee) Pearl Bowlsbey, on Monday. Her office says Duckworth is recovering well and asked for privacy. Duckworth, a 50-year-old veteran who lost her legs in the Iraq War, is one of only 10 lawmakers who have given birth while in Congress. Her first daughter, Abigail, was born in 2014. Duckworth says Maile’s middle name is in honor of Duckworth’s husband’s great aunt, Pearl Bowlsbey Johnson, who was an Army officer and nurse in World War II. This story has been corrected to say that Duckworth’s daughter’s middle name comes from her husband’s great aunt, not her first name.